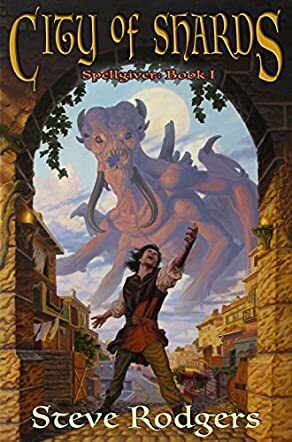 Larin was raised in a temple by his priest uncle, Akul, a former warrior who singlehandedly keeps the largest gang in the Wormpile District away from the four blocks surrounding the temple, making this the safest part of the poorest and most dangerous section of the city. Nowhere is truly safe for Larin, however, who’s plagued by outbursts that compel him to gesticulate and shout in a strange language. Hours in the temple library and chance meetings with a limping mage lead Larin to the startling discovery that these outbursts come from the Lord of Demons, Haraf. The Demon Lord seeks to escape his prison and wreak vengeance on the six-limbed gods who imprisoned him and his kind. The six-legged gods have their own supporters, men who roam through the Wormpile, rounding up converts under the guise of justice and charity, and the Indigens who gather on the borders of the empire, waiting for their moment to invade and enslave everyone. City of Shards by Steve Rodgers is a unique and exciting dark fantasy. The success of magic depends on a combination of innate ability, correct pronunciation of an ancient language, and the phase of the huge moon, Spellgiver. This system creates a perfect equilibrium between complexity and ease of understanding. There were times, especially in the first half of the book, where I became confused between the different pantheons of gods and the particular societies they’re significant to. This does become clearer when the reader most needs it. City of Shards starts slowly as Rodgers immerses the reader in the rich and unique world before pushing Larin towards an impossible choice between future slavery and human sacrifice under the six-legged gods, or annihilation at the hands of the demons. Rodgers removes any truly good outcome from the premise and the effect is amazing.